ALERT – Optical Signal System is a scam! This review of Optical Signal System shows that it is a scam that abuses binary options. It is presented by Dominic Shepherd. Shepherd claims that he developed a trading software that uses a special technology. Thanks to that the software never has losing trades and allegedly can make you $3,000 per day. 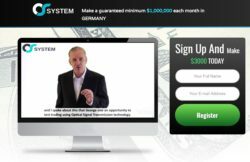 The software is called Optical Signal System and it is free, so you can allegedly get a big income for free. The truth is that Optical Signal System is just a scam. It is a rebranded scam that we have already reviewed under the name of Optical Signal Trader. In our previous review you will find proofs that this program is a scam made to lose your money in trading with a crappy software. It has it all, paid actors, fake testimonials and a worthless trading app. Optical Signal System has a hidden purpose – to earn affiliate commissions to people who run it. So after registering you will be pushed to deposit money with their partner broker, because this is what they need you to do to earn them money. This is how the Optical Signal System scam works. Optical Signal System is an old scam with a new name. If you don’t want to lose money, stay away from it. If you are interested in making money in binary options trading, learn to trade on a free demo account. Build your own profitable strategy and only then you can switch to trading with real money.